In this lab we are going to see the response file generation using the LCM tool for Oracle Identity Management. Note:Here we are assuming that you have already installed the LCM tool. If not click here. Also you have created the folder structure properly. If not click here and see the section 2.5. You have also installed the database. 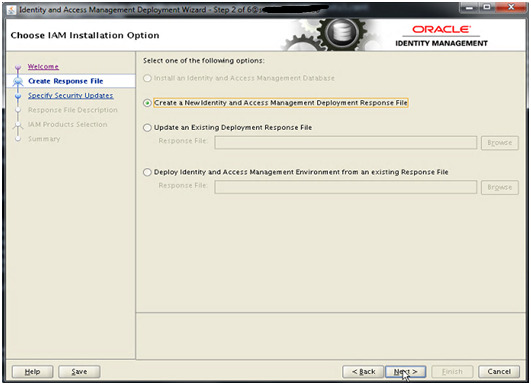 2) Choose IAM Installation Option page is displayed. 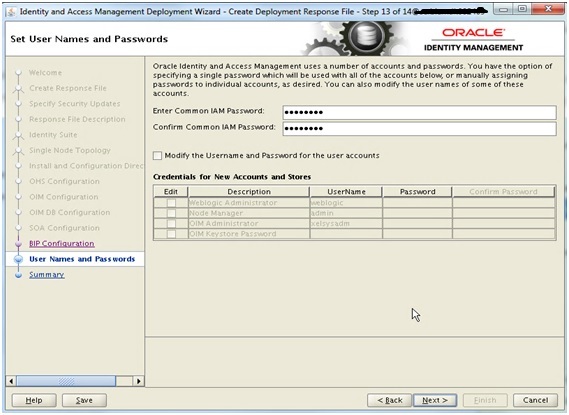 Select Create a New Identity and Access Management Deployment Response File, click Next. 3) Specify Security Updates page is displayed. 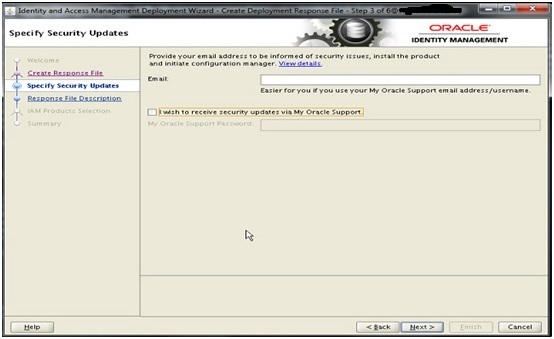 Unselect the checkbox I wish to receive the security updates via My Oracle Support and click Next. 4) Email Address Not specified confirmation box appears. Click Yes. Click Next. 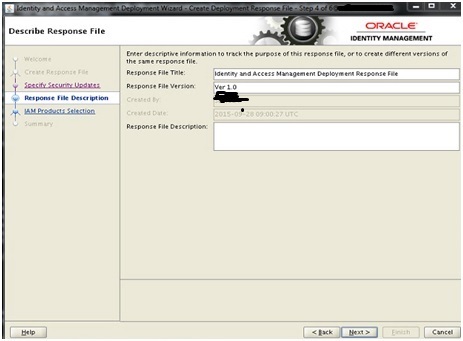 5) Describe Response File page is displayed. Click Next. 6) Select IAM Products screen is displayed. 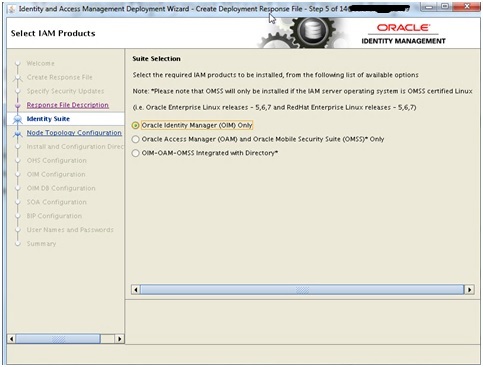 Select option Oracle Identity Manager (OIM) only and then click Next. 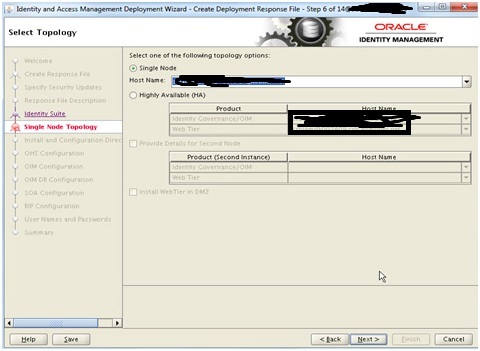 7) On the Select Topology page, enter Host name and click Next. 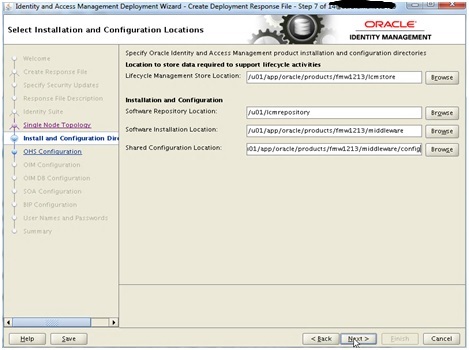 8) On the Select Installation and Configuration Location provide the following values, and then click Next. 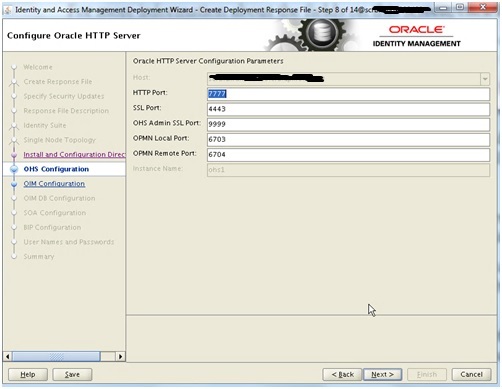 9) On Configure Oracle HTTP Server leave the default parameters as it is and click Next. 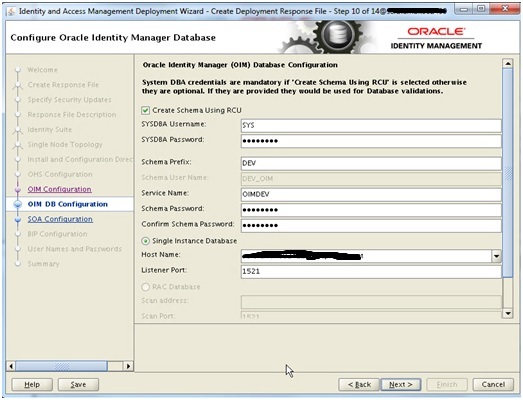 10) On the Configure Oracle Identity Manager leave the default parameter as it is and click Next. 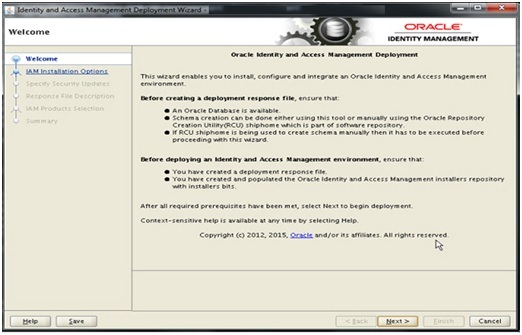 11) Configure Oracle Identity Manager Database screen is displayed. Select Create Schema using RCU checkbox and radio button Single Instance Database.Provide the following inputs and click Next.Here we select create schema using RCU because we want the script to create it and also the service. 12) On the SOA Configuration Parameters accept the default and click Next. 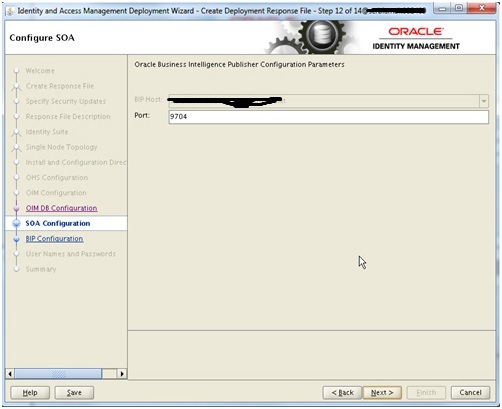 13) On BI Publisher Configuration Parameter accept the default one and click Next. 14) To enter a common password for all the accounts to be created, enter the password in the Enter Common IAM Password field, and then re-enter the password in the Confirm Common Password field and click Next. 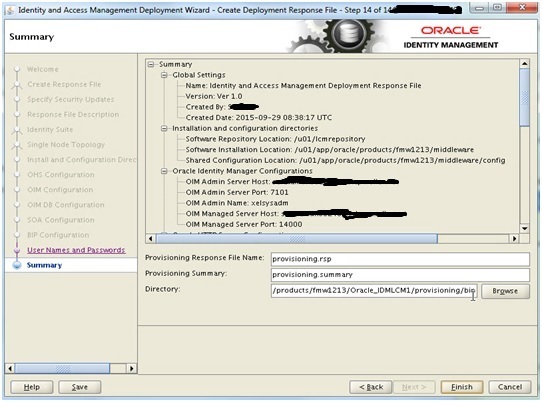 15) Summary screen appears, make a note of the directory where the response file is created. Click Finish.